If you don't know yet, we are a Mandarin-speaking family. Since Angel was born, we have been communicating to her more in Mandarin than English in the hope of building a strong foundation, and more importantly, a love for the mother tongue. I guess it stems from my own love for the language and I wish to pass it down to my kids. Since I was in primary school, Chinese has always been my most-loved subject. Ok, Maths was a close second or sometimes on par. That was why although I chose to study mass comm, I decided to take up a minor in Chinese, and also why I was determined to teach at Berries when I was studying and even when I had a 9-5 job in a media agency. In fact, when I first started A Happy Mum, I was half contemplating if I should make it a Chinese blog. *Do I hear a gasp? * However, even though I think and write better in Chinese, it might take me ages to type one post and I would run into trouble keeping up with the blog, so I decided to stick to English instead. I think a language can define who we are and it is important for kids to learn to speak their mother tongue and for us as parents to keep passing down our cultural roots and heritage. It might sound bizarre to teach this when we were in Sweden but by age of three, we have taught Angel to recite 三字经 and by four, 弟子规. Yes, of course she can't recite the full text (I can't too!) but in my opinion, she can remember a good part of it already and I like to take the chance to teach her about Confucian values like filial piety and respect for elders. When it comes to bedtime stories, I think it is very important for us to have a good mix of English and Chinese books too. A friend once commented that we have a huge collection of books in her library corner, which I seriously don't think so, but anyway when it comes to books, there is no such thing as too many, right? So, I like to let Angel pick her books to read every night and I am glad that every now and then, she will take a Chinese book and attempt to read it on her own. Even though it is based on memory more than word recognition for now. Today, I'm introducing one of her favourite Chinese books which is titled 小蝌蚪找妈妈 (Little tadpole looks for Mama). We have had this book for years but till now, it remains a delight to read. The story talks about little tadpoles who hatch and start their journey in search of their Mama. Along the way, they meet different creatures in the pond and mistake them for their Mama. Each of the creatures replies with different answers, giving them an inkling of how their Mama looks like. While the tadpoles get confused and keep asking “Where’s my Mama? Are you my Mama?”, they begin to discover more about themselves along the way. It's such a fun way to teach our kids about life cycles and how tadpoles grow up to be frogs, don't you think so? 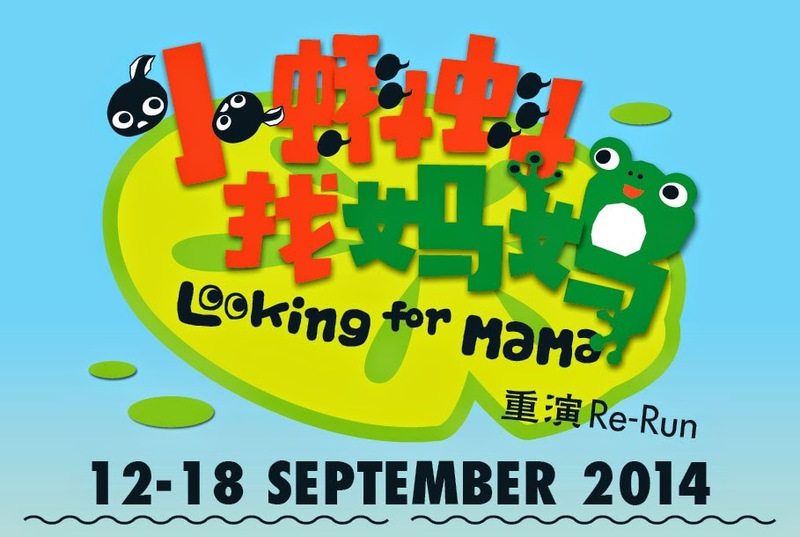 Now, when Angel and I heard that come this September holidays, Paper Monkey Theatre would be holding a re-run of their sold out performance Looking for Mama 小蝌蚪找妈妈, you bet we jumped for joy. I can imagine how she would be able to relate to the story already! With the addition of show-and-tell drama, handcrafted puppets and sing-along children’s songs, I think it will be such a fun learning experience for her. For those of you who are keen to find out more, here are the details of the show. Early bird promotion ($12 per ticket) runs from now to 20 August and you can book your tickets here. 1. Performance is in Mandarin without English subtitles. 2. Duration is approx. 40 minutes without intermission. 3. Suitable for children aged between 5 and 7 years old. 5. No food and drinks are allowed. 6. For children below 5 years old, parental guidance is encouraged. 7. Tickets are required for all patrons for admission. 8. Latecomers are only allowed admission during suitable breaks if any. Paper Monkey Theatre is a Singapore non-profit theatre company formed in April 2008. 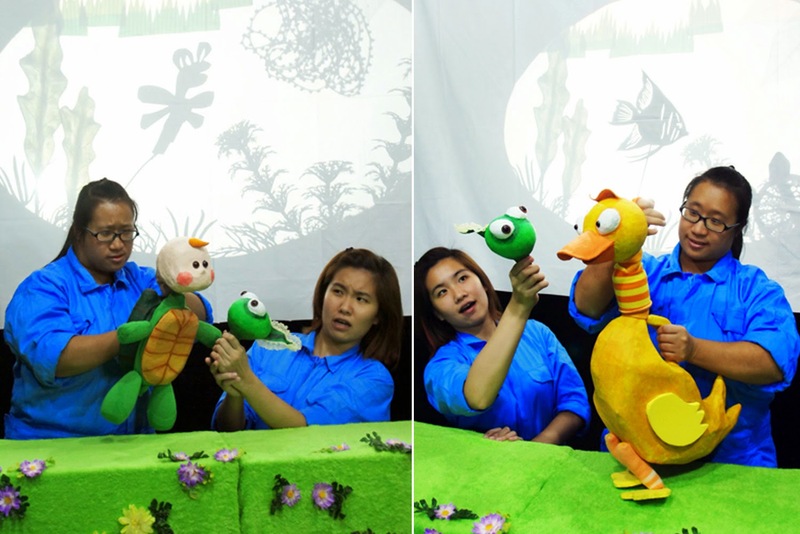 Helmed by well known puppeteer/playwright Benjamin Ho, it focus on providing quality drama programmes such as shadow puppet making workshops and theatre productions for children and families to entertain encourage artistic development and enrich learning experiences. Now, if you are looking for activities to line up for the September holidays and are keen to let your child learn in Mandarin, this is something you might be keen to take part in! Yes, it's a giveaway! 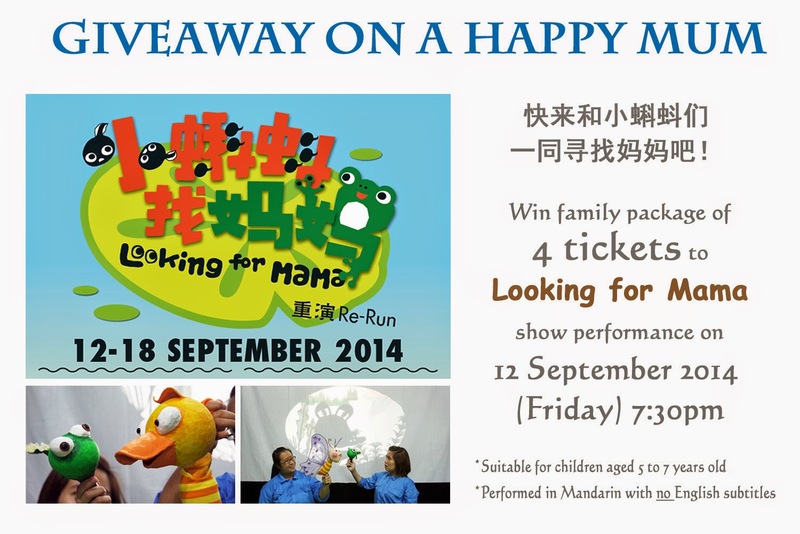 A Happy Mum is now giving away a Family Package of FOUR tickets to the Looking for Mama 小蝌蚪找妈妈 public show performance on 12 Sept (Fri) at 7:30pm. To participate, leave a comment in this blog post with your name and email address. Indicate on the Rafflecopter widget that you have done so and to increase your chances of winning, follow the rest of the steps. Please take part only if you are sure you can make it for the show! Disclosure: We have been invited by Paper Monkey Theatre to watch the public show performance of Looking for Mama. Give me a yell if you see me there, ok? All opinions are our own. Hope to win the tickets. Thanks. I am sure my family will enjoy the play very much ! My kids will love to watch this interesting show. As a mother, I always try to find something fun and interesting activities for my son. Hope can win this giveaway tickets. Thanks for organising this giveaway!